The Mt. Victoria Memorial Park has a high degree of historical and social significance, a beautiful place to stop and rest and a great place for the kids to play. There is a bbq on the north side of the tennis court (our tennis court is free by the way), play equipment, bubblers, picnic tables and toilets. You will see the old grottos that once housed a zoo belonging to the Imperial Hotel, the first War Memorial in the Blue Mountains and a great old bandstand. It has become a valued recreational resource, which has been utilized by many generations of tourists and residents alike. Just off the Highway, turn into Station St. The War Memorial at the Imperial Park on the Highway celebrates it’s 100th anniversary on Saturday 4th June 2016. It is said that this is the first War Memorial in Australia, built during the First World War. In the park there is a memorial for the men who fought and gave their lives during World War I. A total of 80 names are displayed on plaques at the base of the memorial including some of Mount Victoria’s pioneering names. If you want to take a break, turn off the highway onto Selsdon Street and then turn left onto Montgomery Street. This is a good place to park while you have a stroll around. A large crowd assembled in Mount Victoria Park on Monday afternoon to witness the unveiling of a fine memorial in honor of the men who have enlisted for active service from Mt Victoria and the immediate districts to the west and south. The enclosure was decorated with bunting, and the weather was favorable. Cr. W. J. Green, president of the Blue Mountains Shire Council, presided, and he was supported by Crs. Wall, Matthews, Staples, and Commens (Blaxland), besides a number of ladies among whom was Mrs. Wall, who performed the unveiling ceremony. Among the general visitors were noticed residents of Katoomba, Blackheath, Bell, Hartley, Megalong, Hampton, and Lithgow. Among the latter were Major A. E. Reay, and Lieut. Sullivan, representing the local recruiting authorities. The monument, which certainly reflects credit on the builder (Mr. T. Lanfranchi), is of reinforced concrete, 12 feet high, and oblisk in shape. The base is seven feet square, upon which stands a central cube. The sides of the cube are faced with ironide, to which the brass plates bearing the names are adjusted. The face of the obelisk is roughly cast, with a rifle delineated in cement on each of the four sides. It is surmounted with a ball and base 15 inches high. A neat cement banister carrying a rail runs around the top of the main base, thus neatly enclosing the cube. The monument is prominently situated in the centre of the park. Excerpt from Mt Victoria Soldiers Memorial, Lithgow Mercury (NSW), 5 June 1918. ANZAC Art Prize: “Poppy Day – Memorial Park, Mount Victoria” after a poem by A.N.G. Irving (served AIF 1915-1917). This painting was inspired by a Digger’s poem written during the 1920s lamenting the lost. 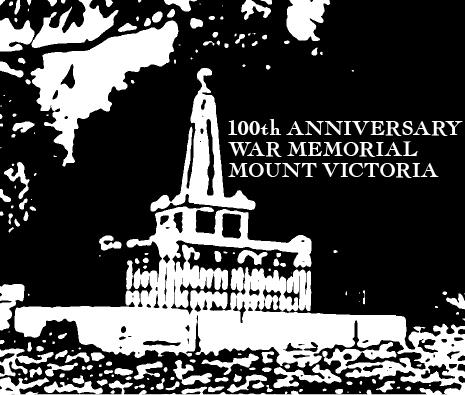 The Mount Victoria Memorial Park monument to those who served during WW1 provided the main motif as it was completed around the time. The oil on board painting was started plein air in the park then completed in the studio using photographic and still life references. The painting and the poem highlight suffering and loss with the symbols of floral tribute. The veterans can be seen in a wheelchair, leaning on a corner post to ease an aching stump. The sulphur crested cockatoo screeches from a tree top angry as their morning grass seed is trampled by the crowd. A single white feather flutters to the ground. And in the distance is my grandfather, shot through the chest at Gallipoli, Light Horse, trudging up the hill with his thoroughbred to a training track. He wanted no part of it. Couldn’t see the fuss of ANZAC day when he struggled to get a fractional pension from the DoD. Let’s not treat our service people of recent conflicts the same way. The poem was published in “Songs of a Golliard” by Guy Weller, A.N.G. Irving’s grandsons book. HISTORY OF THE GROTTOS… THEY ONCE FORMED A ZOO! The concrete formed structures in the park were built in the 1930’s for a small zoo. They were designed by Tom Adams who had already built similar structures at Taronga Park Zoo. These ‘grottos’ are made from cement-rendered steel and wire mesh and were likely to have been created by Adams either with his assistants from the zoo, or by local men employed under the Depression Emergency Employment Scheme. Such grottos became popular in the Blue Mountains and similar ones were constructed in parks in Katoomba and Leura. We know there was a tame eagle, two kangaroos, a tame fox, snakes & lizards and beautiful birds. The zoo remained here for several years, closing some time in the late 1940’s. In 2015, successful grant applications meant that we were able to commission two artists: Lindena and Tracey Fitzgerald to create murals for the grottos and toilet block. These are were completed early 2016 and are be an exciting addition to our park. The committee making the decisions on design and artist are the combined efforts of Blackheath Area Neighbourhood Centre, Mt Victoria Community Assoc, Mt Victoria Historical Society and Mt Victoria Public School P&C Assoc. Interpretive signage on the history of the grottos is in place at the back of the 1940’s cabin grotto. Designed by Kara Smith in conjunction with BANC, research by Blue Mountains Library and the Mount Victoria Museum.